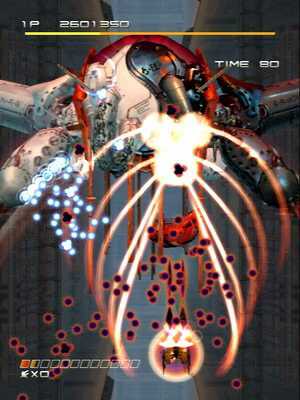 Ikaruga coming to XBLA - GameSpotting! Posted on April 7, 2008 by MASA. Categories: Gaming, Old School, Xbox360. Ikaruga is a game most gamers have never heard of, probably due to it’s horrible sales on the developer’s console of choice, the GameCube (after being on two SEGA systems). In Ikaruga, you play as a fighter pilot in futuristic Japan (the details are complex), who is the sole pilot of a freedom fighter brigade that was wiped out by a group calling themselves the “Divine Ones” because their leader found unspeakable powers from something he digged up. This game is really different from most top down, horizontal arcade shooters. Enemies and bosses come in two different ways, powered by black and white polarity (think magnets), and your ship can switch between these two polarities. For example, if an enemy is firing white polarity powered bullets, you would want to switch to white polarity to cancel out the damage (and charge your laser), and then kill the enemy by switching to black and firing black polarity blasts. Ikaruga will be having a second chance (its sales were quite high for a port, but unfortunately, since it released on the GameCube and the Dreamcast [a year after the DreamCast was discontinued by SEGA], its the sales weren’t too well for a videogame). And this time, it will be able to see a new audience. Ikaruga is available this Wednesday for 800MS Points. Strong Bad game launching on WiiWare »« New Virtual Console games. Pass them on.